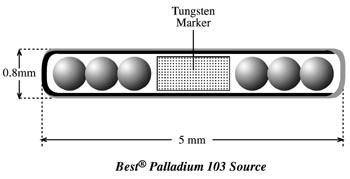 • Stephen W. Peterson and Bruce Thomadsen, "Measurements of the dosimetric constants for a new 103Pd brachytherapy source," Brachytherapy 1: 110-119, 2002. • A. S. Meigooni, Z. Bharucha, M. Yoe-Sein and Keith Sowards, "Dosimetric Characteristics of the Best® double-wall 103Pd brachytherapy source" Med. Phys. 28: 2568-2575, 2001.